Mike is known in Britain and internationally as a painter, etcher, writer, teacher and television personality. He originally trained at Watford School of Art (Graphic Design), and after teaching art in Hertfordshire schools (his original home) carried out a postgraduate course in printmaking at Brighton College of Art. Whilst still a student at Brighton, he was elected (one of the youngest ever) Associate of the Royal Society of Painter-Printmakers (RE), became a fellow in 1971 and subsequently served as Honorary Secretary and later Vice-President. His love of painting was found early. From the age of 12 he knew what he wanted from his life, and has been lucky (and hard-working) enough to achieve this. A lifelong love of watercolour was rewarded in 1993 with his election as Associate of the Royal Watercolour Society, and his elevation to full member in 1997. Mike’s work, both in painting and printmaking, has made him one of Britain’s most well known painters, and he is represented in many public and private collections worldwide, including those of HM The Queen, HM The Queen Mother, ex-King Constantine of the Hellenes, Prince and Princess Michael of Kent, The Ashmolean Museum Oxford, The Fitzwilliam Museum, Cambridge, and the Daily Express (mural for the Boardroom). 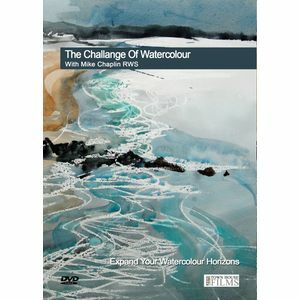 Mike achieved great popularity as resident art expert on the hit Channel 4 programme Watercolour Challenge with Hannah Gordon. With 3 series and over 60 programmes Mike reached an audience of over 1 1/2 million . In 2007 Mike was given the enormous privilege of using J M W Turner's pigments to be ground by him into watercolour. The paint was subsequently used by him for filming Turner's watercolour techniques for a permanent exhibition at Tate Britain in London.